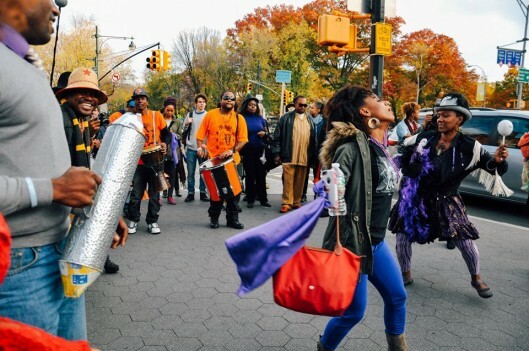 Richard Fleming interviews cultural activist Allenby Augustin, of Haiti-based cultural organization Akoustik Prod, and Régine Roumain, Executive Director of the Haiti Cultural Exchange in Brooklyn. Augustin participated in a week-long arts residency at the Haitian Cultural Exchange (located at FiveMyles in Brooklyn) that engaged a number of artists of the Haitian Diaspora and kids of the afterschool youth arts engagement program at Public School 189 in the mission of the organization: the preservation and promotion of Haitian traditional arts. The workshops led to Bann Konte, the Exchange's Rara Storytelling Procession. On a beautiful fall afternoon, the Crown Heights community gathered to celebrate the Haitian tradition of oral storytelling, songs and games. Bann Konte is a procession of rara musicians, traditional games, and folktales. Featuring the historic Haitian conch, traditional konè (a long metal horn), bamboo trumpets and Haitian drums, Bann Konte features traditional Haitian folktales, games, and songs. The rhythmic procession stories in an atmosphere of conviviality and creativity. Performers will include: Allenby Augustin, Goussy Célestin, Schneider Laurent, Michèle Voltaire Marcelin, and Djarara. Co-founded in 2009 by Régine Roumain, the Haiti Cultural Exchange has developed programs designed to present Haitian culture to a broad audience, while supporting emerging and established artists, promoting cross-cultural exchanges, and encouraging dialogue around contemporary social issues.